A lumbar microdiscectomy involves the removal of a herniated disc (the tissue that separates each vertebra) from the lower spine. For the benefit of his patients, Dr. Luis Manuel Tumialán offers minimally invasive lumbar discectomy, which is less disruptive to surrounding tissues than traditional open surgery. Using this treatment, Dr. Tumialán can relieve pain, weakness, and debilitating discomfort. The minimally invasive approach also results in a shorter recovery time. As Dr. Tumialán says, "I want to help my patients put this episode of their lives into their rear view mirror as quickly as possible." To learn more about minimally invasive lumbar microdiscectomy, contact Dr. Tumialán today. He proudly serves the greater Phoenix and Scottsdale, AZ, area. A spinal disc can become herniated from physical trauma, or degenerate over time with regular wear and tear. When a lumbar spinal disc becomes herniated, it can cause pain, spasming, numbness, weakness, or loss of functionality in the lower body. The discs in the spine are small, circular pads containing a gelatinous inner tissue surrounded by a thicker outer shell. These discs cushion each section of the spine and prevent the vertebrae from rubbing together. Vertebral discs become herniated when the outer shell of the disc (annulus fibrosus) breaks down and releases the inner tissue (nucleus pulposus). Herniated discs can impede on the nearby nerves in the vertebral column. When these nerves are compressed, they cannot function properly. Using MRI imaging or CT scans, Dr. Tumialán can diagnose the cause of your symptoms. These scans, in conjunction with private patient consultations, allow Dr. Tumialán to create a targeted treatment plan. In many cases, Dr. Tumialán can use minimally invasive lumbar microdiscectomy to carefully remove the disc using very small incisions. 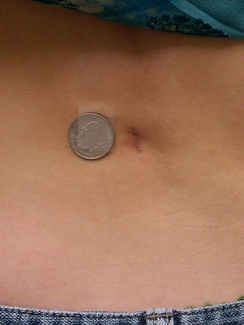 Dr. Tumialán will make small incisions, about an inch in length, on the lower back. 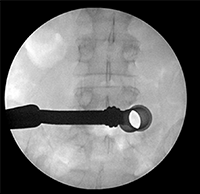 He is then able to access the lumbar spine using specialized surgical instruments. Dr. Tumialán will remove a small portion of vertebral bone, called the lamina, to access the tissues beneath it. Within the vertebrae is a long column of ligaments and nerves. Dr. Tumialán must move the ligaments and thecal sac (a membrane that surrounds the spinal cord) using a retractor. Once this is complete, Dr. Tumialán can carefully remove part or all of the herniated disc. He may fuse the bones that surround the disc to stabilize the spine, or replace the herniated disc with a prosthesis. 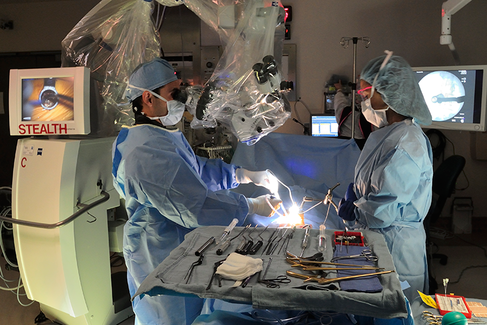 Traditionally, lumbar microdiscectomy is performed as an open surgery. This type of procedure requires much larger incisions and is more intrusive to the back muscles and tissues. 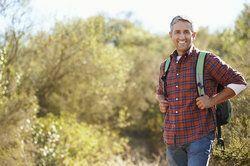 Minimally invasive lumbar microdiscectomy and other minimally invasive procedures allow Dr. Tumialán to reach the treatment area and perform the needed procedure with little to no impact on surrounding tissues. Because of this, minimally invasive spinal treatments usually heal faster than traditional open surgery treatments. Patients are able to return to their daily routines sooner and regain regular function while suffering less discomfort.